The King County Road Services Division replaced the original bridge, built over 100 years ago, which carries SE Mount Si Road across the middle fork of the Snoqualmie River east of North Bend. The bridge provides the only access across the river for local residents, and is a gateway to regional outdoor activities within the Mount Si Natural Resources Conservation Area. The new bridge was built next to the original one, and its alignment will improve visibility for drivers, provide wide shoulders for bicyclists and provide new sidewalks for pedestrians. It is also longer than the previous bridge to avoid interfering with the river's natural width. Fazio Associates was responsible for roadside planting design, mitigation and pond planting, art coordination and integration into the overall planting scheme. 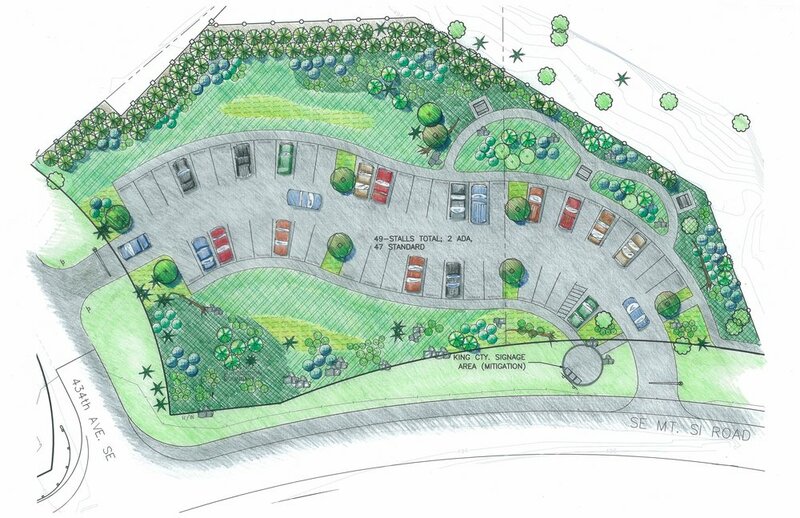 As part of the project mitigation, Fazio Associates also was the lead designer for a new parking lot for DNR that services Mt. Si trailhead and the surrounding area. The naturalistic parking lot included 45-parking stalls, meandering paths, picnic tables, open spaces and a formal area that includes King County’s historic mitigation signage for Mt. Si Bridge.